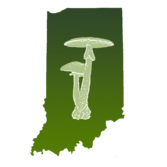 Topics regarding identification of wild species in Indiana. Morels and half free morels? Any morels in southern Indiana yet? Any Morels in Northern Indiana yet? My first giant puff ball?